Within the raid instance Zul'Aman, lies another option for making some gold. 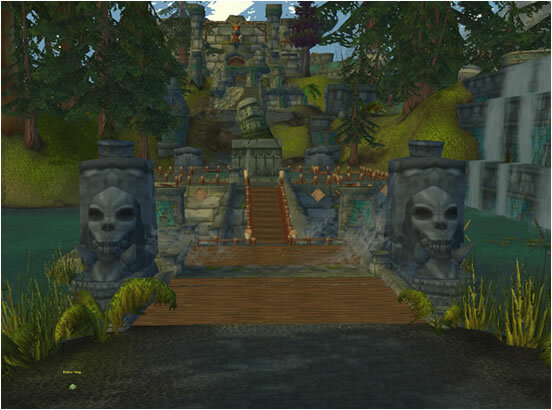 The Forest Frogs that surround the central lake are actually npcs under the influence of a voodoo spell. If you free them from the hex, they will return to their humanoid form and have various gifts they will leave for you. In order to release the frogs from their curse, you need to gather Amani Hex Sticks from the trash mobs inside the instance. These Amani Hex Sticks will revert the frogs back to humanoid form. You must use the Amani Hex Sticks before you die or leave the instance. If you die, leave, or logout all of your Amani Hex Sticks will dissapear. So use them as you get them to be safe. These Forest Frogs also have the ability to give you a rare vanity pet, Mojo. If you get lucky, after you free a frog, he may place Mojo in your backpack. Mojo is a very unique vanity pet that once you summon him out you can /kiss him and he will turn you into a frog and then start to whisper to you. Unfortunately Mojo is BOP, but there are more money making options from these frogs. Most of the converted frogs will drop chests for you to open. They can contain gold (around 15g) or charms to use as buffs within the instance. Sometimes you can get Mojo from them. There are also 2 vendors that can spawn from these frogs. Kyren sells reagants and Gunther sells food. Both of these vendors have the chance to spawn a limited quantity Sealed Scroll Case. These cases can contain a pretty high selling BOE recipe. Check out the full content options. Some big money makers, if you get the right scroll to drop. So whether you are just in for the raid achievement, are farming for Mojo, or are just messing around in the instance solo, be sure to use up all of your Amani Hex Sticks in hopes to have a chance at this scroll lottery. I did this farm for Mojo myself, if you have a full threat drop ability eg. feign, vanish or in my case on my night elf priest - shadowmeld then you can do the following. Pull the patrolling packs that drop the hex sticks and kill one, loot it and if its got a hex stick use it. if you have an aggro reset you can use that and then when they pat away you can use the stick on a froggie. The reason for doing this is that the aggro reset causes the one you killed to respawn so you can effectively farm them indefinitely like that. So you know when you hit backspace, to erase a letter or such? Yeah, I just had a full post to ask you a question about *swearing* and then my post was erased. Thanks backspace. ANYHOW! So I went to Zul Gurub in order to chase mounts/pets... but I can't get in. Says I need to be in a raid. What? whaaat? I open a raid... what. i am losin my mind! Please, what is this MS missing? @ Shobbs just email me your question please. Any of the old raids are still raids, so they do require that you are in a raid when you enter. All you need is one other person to group with you, then switch it to a raid (hit "o" to open panel and select raid tab, then the convert to raid button). Most raid instances once you enter inside, you can kick the other person and you will still be able to farm the raid instance solo. In Zul'Aman I think you need to still be in a raid, while you are banging the gong open to open the gates.